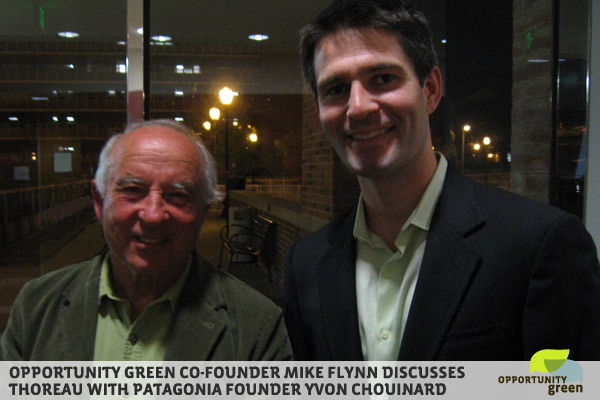 Yvon Chouinard…legendary rock climber, founder of Patagonia, and first member of 1% For the Planet spoke at the Oppenheim Lecture Series at the UCLA Institute of the Environment and Sustainability last night, co-hosted by Opportunity Green. 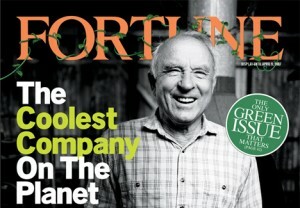 In a very off-the-cuff, often comical, manner, Chouinard shared his life story about how he began selling products based on a self-serving need and ended up not only at the helm of “The Coolest Company on the Planet” (according to Fortune Magazine), but also THE pioneer in corporate social responsibility. Chouinard recalled a lesson learned as a young toddler when having to climb stairs to receive the reward of a spoonful of honey: “There’s a lot of reward in high places”. He attributes this lesson to his later interest in mountain climbing and the accidental founding of his first company, Chouinard Equipment, Ltd. In the 1960′s, Chouinard accomplished a lot of “firsts” in mountain climbing: the first ascent of the North Face of Mount Edith Cavell, the Beckey-Chouinard Route on South Howser Tower in the Bugaboos, and the North Face of Mount Sir Donald. He questioned the impact of hammering large metal pitons into the rock, as climbers did at the time, and wondered if a better, less environment-impact product could be made. That curiosity led him to create a better quality product and won him 80% market share of the climbing tool business. Like the climbing tool business, Chouinard entered the climbing/outdoor apparel business the same way. In a self-serving need for better quality, more durable clothing for climbing; he realized he could do it better. As with his quest to create more environmentally-friendly climbing gear, Chouinard followed the same path of being an innovator, not just an inventor. As he states, “invention is only 1% of it.” The principles that led to the success of his rock climbing tool business – focusing on the process, not the profit and leading by example – remain core values of the man and the company that would later come from his stumbling upon a red, yellow and blue striped Rugby shirt in Scotland. Chouinard entered the clothing business by first importing a rugby shirt he bought while climbing in Scotland. One of the first products he created was called “the stand up short”, named so because in its original form was made of very firm canvas (the same kind used for lawn chairs) and the shorts could literally stand on their own (still a top seller for Patagonia today, but in a less firm organic cotton canvas). Chouinard’s approach to clothing making was unique, he used an industrial design that provided security and durability for climbers and outdoorsmen. He wanted to make the best clothing possible, because he himself was the consumer. In the 1980′s, Patagonia continued its industrial design approach to clothing making and began investing in research and development of new, better materials. From fake fur his wife found at the Los Angeles Merchandise Mart, Chouinard and his team tested, tweaked and then introduced both Synchilla® and Capilene® polyester fabrics. With these two advancements, the company grew at an astounding rapid pace and even made Inc. Magazine’s list of the fastest-growing privately held companies. Quality – What is quality in clothing? It needs to be functional, in our case, multifunctional. Cause no unnecessary harm – create the best quality product with the least impact. Hire self-motivated, intelligent employees and give them flex time to enjoy surfing, climbing and being with their family. How did Patagonia become one of the greenest companies on the planet? It was Chouinard’s interest in digging deeper and evaluating the problem, not only the symptom that began Patagonia’s mission of corporate responsibility. When Patagonia opened a retail store in a restored building in Boston, the employees complained of headaches. Assuming it was only a problem with the building, Chouinard was shocked to find out it was a combination of the merchandise being in a poorly ventilated space. Consequently, tests of the four main fibers used in Patagonia clothing yielded even more shocking results. Cotton, seemingly the most natural of the four, was the worse offender of the environment. Fabric labeled as 100% cotton was really only 73% cotton, the other 27% was toxic chemicals used in the process of growing, picking, and making cotton garments washable, wrinkle free, etc. From this discovery, Chouinard created an Environmental Philosophy for Patagonia. How do we treat our water resources? Within 18 months time, Patagonia completely stopped using industrially grown cotton fabric. The shift to clothing made only from 100% organic cotton not only CREATED an organic cotton industry, but also reduced the footprint of toxic pesticides used in the cultivation of cotton, the resulting pollution of soil and water, and damage to the health of fieldworkers. Patagonia was a founding member of Textile Exchange, an organization bringing together product brands and retailers, farmers and key stakeholders, to learn about the social and environmental benefits of environmentally conscious textiles. “It’s not a charity. It’s a cost of doing business. We use it to support civil democracy.” Patagonia has been contributing 10% of pre-tax profits or 1% of sales, whichever is greater, each year to environmental groups since 1985. Formally launched in 2001 by Chouinard and Craig Mathews, owner of Blue Ribbon Flies, 1% For the Planet, set out to support the people fighting on the front line of environmental issues. “I used the company to persuade other companies to follow suit.” 1% For the Planet has raised over $40million since its launch and provides support to over 450 different environmental organizations. First, asking the consumer if they “need” the product. If something breaks, we’ll fix it. When you no longer want it, we’ll find another owner for it. (Patagonia will be partnering with eBay on this program). When it is dead, unable to be worn, give it back to us and we will break it down and use its components again in new products. *Opportunity Green is a proud partner of the UCLA Institute of the Environment and Sustainability and co-host of last night’s event. Great recap of an awesome event! We have a LOT of gear to get now that we’re in Colorado and I’m so glad to know what a responsible company Patagonia is. Now we need where to put our focus! I agree with Amanda above. There is great amount of inspiring infomation in the short summary presented. Hopefully the masses wil embrace Mr. Chouinard’s messages and ideas. Very informative article. I feel like I was there myself. Amazing how out of mountain climbing so much green industry evolved.